Polestar presents 6 achingly beautiful tracks of reflective yet playful electronica, taking inspiration from the area of Bristol where he grew up. "This is basically how Tron:Legacy should have sounded before someone gave Daft Punk an orchestra"
"A high replayability factor makes this one a winner, and worth owning. " railway viaduct during the summer, and later worked at a nearby chocolate factory, now derelict. With "End of an Era" Jon Elliott also says goodbye to eight years of making electronic music as Polestar, making this EP all the more poignant. Primarily a digital release, we're also offering strictly limited CD-R copies, only available direct from us. CD ALREADY SOLD OUT!
" 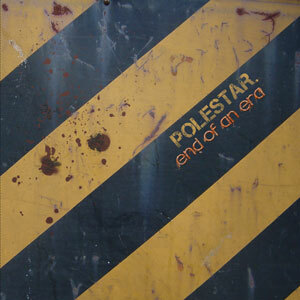 Reportedly ‘End of an Era’ is Jon Elliott last release using the name Polestar and given that his first release ‘Camplex EP’ on Boltfish Recordings was reviewed in 2005. The exact same thing could be said of the six tracks on ‘End of an Era’ that represents the closing chapter of the musical acquaintance that has been: Polestar." "The first thing that strikes one about 'End of an Era' is just how pretty it all sounds. The synth sonics and melodies are very pleasant; percussion is light even when highly active, and sometimes hyperactive. In fact, the music sounds so sweet in a wistful sort of way, it almost verges on New Age. Almost. The inspiration behind this Polestar album has to do with the area of Bristol, once actively industrial, and now like Detroit, only a shell of its former self- abandoned, derelict factories, etc. Instead of doleful, depressing gloom, Elliott expresses a dreamy, contemplative nostalgia in the music. Through cute little arpeggiated sequenced melodies accompanied by playful, tinker-toy percussion, there are numerous occasions where the music is downright happy and smiley, and very bouncy. There are tracks, or parts of tracks on 'End of an Era' that I could easily picture as background music in television commercials, tracks such as 'Seven Span,' 'A Person of the Past,' 'Music for Abandoned Factories,' and 'Ups320'. That's NOT a bad thing though. There is a LOT of money spent in advertising to get good, memorable music. (Commercial producers take note; you need to check this stuff out!) For the IDM enthusiast, there is plenty to latch onto, and the ambient lovers should enjoy the Enoesque cloud pads in 'Legacy'. Polestar's perky beat-programming gets quite elaborate at times with its infusion of glitch-click 'n whirr. Mostly, it works with the music, although there were a few occasions I thought it went a little overboard. Still, I haven't heard an album of this ilk that was so instantly likeable in a while. Like a frisky pet, the music may surprise and delight you. It goes down easy, but not so mellow that you'll be bored. A high replayability factor makes this one a winner, and worth owning. Available from Boltfish as a digital download only now." "Bristol-based electronic producer Jon Elliot first emerged back in 2005 with his debut Camplex EP on Boltfish, and since then he’s released a steady stream of predominantly IDM-glitch oriented material on labels including En:peg Digital, Rednetic and Netwerk Records. As its title hints, this latest download-only EP on Boltfish End Of An Era represents Elliot’s last work as Polestar before he retires the alias after eight years of making electronic music. It’s something that certainly amplifies the sense of poignancy surrounding the six tracks collected here, which were apparently inspired by the now derelict area of Bristol where Elliot grew up. Opening track ‘Seven Span’ nicely introduces the refracted, crystalline IDM aesthetic that colours much of this EP as crisp clicking rhythms tread a broken and treacherous path beneath glacial melodic pads and subtly placed bass tones, the resulting near-ambient glide calling to mind the likes of Cheju, before ‘Derelict Disused’ unleashes this EP’s most extrovert moment as a rippling Klute-esque synth sequence wanders against off-step junglist rhythms and brooding sub-bass, sudden DSP contortion and timestretches dropping in and out of the mix. Elsewhere, ‘Music For Abandoned Factories’ sends a floaty Kraftwerkian synth melody gliding alongside sheeny electro rhythms, slowly building up a lulling sense of pristinely synthetic serenity, before title track ‘End Of An Era’ sends a virtual datarush of bleeping robotic zaps sliding over an oceanic sounding backdrop of glacial melodic chords, chiptune synth accents and skittering breakbeats, the rising analogue synth tones lending a palpable sense of human warmth to the brittle rhythms that play above. If ‘End Of An Era’ does indeed represent Elliot’s last work as Polestar, it’s certainly a more than worthy parting selection." "Happy New Year and RIP Polestar. Bristol’s Jon Elliott has been intermittently releasing sweet, über-collectable electronica for six years now, but for him 2011 signifies the year to pack up shop. Nothing to do with the VAT hike, he insists, but it still feels like a harsh decision when measured against the energy of his music. Polestar’s succulent, complex beats were like Alka-Seltzer for the ears, and also weren’t afraid to spy on pop while dabbling with ever-smarter drum patterns. Elliott’s final release seems to mirror the shifting pop industry itself, paying homage to the grand Bristol warehouses which have been threatened with development since his childhood. It’s strange to think that “exciting sites for luxury apartments” could reach the city where they built the Treasure Island ship. It’s even stranger to think that Elliott was once a genuine roughneck himself, spending many a happy hour melting cocoa in the chocolate factory until Kraft outsourced the Oompa-Loompas. Perhaps feeling as mischievous as he did during his chocolate-making days, “Music for Abandoned Factories”—the start of side B on ...Era—finds Polestar fooling you with a round of nostalgia: crisp, antique synthesisers from public TV that make you think you’re watching a glass-blowing documentary. However, the frantic click-track and rim-shots of bass are too wild for kiln fires and soda-lime, and by the time the piece is up on its legs you’re looking at a smashed church window—one set to the same chords as the average Status Quo song. And that’s “Abandoned Factories” in a nutshell, looping for a further three minutes before shaking off its layers, slowly fading and leaving you with one tinkling keyboard. The music’s brief life is the antithesis of the destroyed industries it references, and as you come to the end of its warm ride you think perhaps it is time for something new (after all, fidgety electro-nostalgia is so 2003). Still, it’s a fitting goodbye from synth nerd Polestar, and if there isn’t a Horizon special about atomic accelerators that doesn’t use this as its soundtrack then atomic accelerators aren’t fun anymore. Elliott should’ve blown out the scientists and sent this direct to Jeff Bridges. This is basically how Tron:Legacy should have sounded before someone gave Daft Punk an orchestra." "...minimalist dance music which bears similarity to Future Sound of London or LFO"
"Jon Elliott closes up his eight-year run operating under the Polestar moniker and leaves Boltfish, as well as his listeners, with a 6-track album full of shiny, metallic shards of electrical trickery. Obsessed with complicated beats, “Derelict Disused” unfolds like a cataclysmic event soaked in microscopic drum’n bass and a delicate groove that sparkles from the first to last seconds. “A Person of the Past” projects a reserved, almost downtempo synth aesthetic that manages to evoke a sense of peace and calm in the myriad of complex beats surrounding this release. “Music For Abandoned Factories” is an apt title crossing 4-minutes of delectable electronics and a subtle passage through casually complicated percussion that ends too soon to fully appreciate. The title track is perhaps the defining moment for End Of An Era, as it delivers heartfelt slices of electronic beats, snaps and pulses. End Of An Era may be Polestar’s final musical offering, however, if the closing track (“Legacy,”) is an indication of the artists ability to craft sonic ambient masterpieces, then we’re definitely looking forward to the next iteration of this sound as it just may very well be the finest of the lot."